These are the easiest homemade rolls I have ever made! I can’t even count the number of times I have tried to make rolls and they turn out horribly. Many of the recipes I have tried consist of long periods of letting the dough rise, kneading, and complicated instructions but these don’t need any of that! All you need is a little time, a bowl, mixing spoon and a rolling pin! These rolls turn out perfect every time! No kneading or stand mixer required! Add 4 cups of all-purpose flour. Mix well with a spoon, cover bowl with plastic wrap and allow dough to rise 4-6 hours or overnight in the refrigerator. Do not knead the dough. Turn out dough on a lightly floured surface and divide in half. Roll each half of dough into a circle about 1/8' thick. Brush with additional melted butter and cut into 16 pieces, like a pizza. Roll up each piece from the large end to the point. Place rolls on a baking sheet and let rise 30-60 minutes. YUM! I'm excited to try these out! Love them! I wondering if they could be frozen? Sharon- I definitely think that these would be just fine frozen! I have not tried it yet, but I think that it is a great idea!! Have you ever doubled this recipe? I know some recipes just don't work doubled. If the ingredients are the same, the end results should be the same. 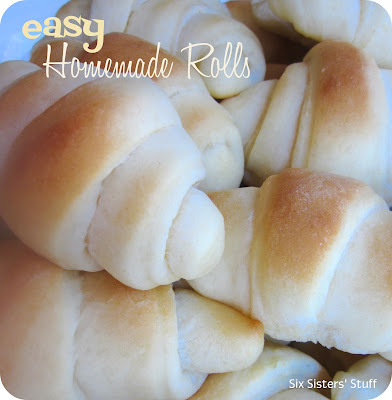 I have never made rolls before but I think I will try this one. I have been looking for a lemon crescent role recipe....use to have ths lady who made these for a restaurant i use to work for and they were DELISH.....cud I add some lemon to these? If so, wud that be extract? lemon juice? or what? I would think that some sort of lemon glaze would be delicious. I'm going to try this recipe with King Arthur's white-whole wheat flour! could you use self rising flour and leave out the salt? I have never tried that, so I am not sure how it would work. Let us know how it goes! Is there any way to speed up the rising time on these? I looooove this recipe. I've been experimenting with several different ones and these taste the best HANDS DOWN! But if I forget to start them in enough time (which is always) then I end up having to eat them for dessert (which is ok too!). But if I don't mind kneading or mixing or doing any other tips - is there a way to speed it up? I totally read the last bit of the recipe incorrectly, but boy, were these the biggest, yummiest rolls ever. My hubby is usually the family bread baker, but these got rave reviews! Thank you. Instead of spoon can you use bread hook on a standing mixer? I guess you could, just be sure you do not knead the dough. Okay, I just need to clarify so I don't screw them up :). Is it 4-6 hours on the counter or are both options in the fridge? 4 to 6 hours on the counter or overnight in the fridge. What's the yield on this recipe? What's the yield on this recipe? 12? Okay, so I don't bake much but want to try these. Roll out the dough to how big a circle?! I simply could not believe that these rolls could actually be this easy and taste this great so yesterday I "practiced" as I didn't want to face Thanksgiving with inedible rolls just in case... Well let me tell you...these are simply the best and easiest yeast rolls I have ever made. I'll never use my old knead and rise and knead and rise recipes again. Looking forward to pleasing everyone at the Thanksgiving table with these hot from the oven rolls. Thank you so much for sharing this recipe with all of us. We just tried pinning these rolls and we had no problem. Hopefully it will work for you now! this is the best ! can you use this recipe for cinnamon rolls ? Yes, this would work for cinnamon rolls too! When you say "mix yeast, sugar, eggs, water, butter and salt together in a large bowl, all at once." - do you mean mix with a spoon? or a mixer? thanks. You divide the dough in half and roll out into 2 circles. Cut each circle into 16 slices. That will give you a total of 32 rolls. Hi! I am new to yeast breads. I mixed a 1/2 recipe to test it before Christmas, last night, and refrigerated it. This morning the blob looks exactly the same size as it did last night. Is it supposed to have raised or now do I raise it for six hours on the counter, or do I roll it out and cut it and then it raises? I'm not even sure if the yeast is activated. Please help! Thank you! Hi Shannon! It definitely should have raised by then. Your yeast must not have activated. Either your water was too hot and killed the yeast when you mixed everything together or your yeast could have been old? I know I've had that happen before when I've had bad yeast. I'm sorry I'm not more help! These are great. I think 16 rolls are too small, but since I always cut a little 'off' it is easy to make a larger wedge into 2, so I got 10. 8 would make wonderfully large and fluffy rolls. I'm glad I stumbled upon you and decided to give it a try. I will definitely make these again and again. BTW: I put my dough into the oven to 'proof' and it only took 1 1/2 hours--and I was planning on 4 ! It worked out great though, since I am having the missionaries and wondered when I was going to do dessert between making these rolls. So, for those of you looking to shave off some time, many ovens come with a read proofing button--or just crank up the heat in your house for a few hours--or put bowl of dough on top of a small heating pad....THAT works wonderfully . sorry....a 'bread proof' button ! !